This is the time of year when the markets are beginning to show signs of spring while winter cabbage is still plentiful and the oranges seem to be sweeter than ever. Creative salad making is easy when there is so much to choose from. Don't get caught in the doldrums of boring salads. Explore the produce isles and get creative by adding some new fresh edibles to your menu. 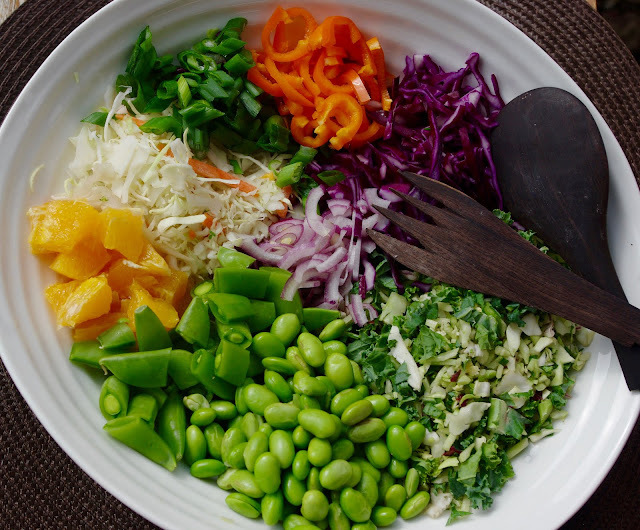 Fill a bowl with green and purple cabbage, kale, carrots, sweet peppers, green and red onions, peas, edamame beans, oranges. These are just my choices, but add or take away to suit your taste. Try substituting mangos for the oranges, adding fresh avocado, or adding toasted almonds or pumpkin seeds. Dressing and salad toppings really make a salad. This dressing is enough for 8-10 cups of vegetables. Place all ingredients into a small jar. Shake well and refrigerate until ready to use. Crumble noodles onto a baking sheet. Bake in 400º oven for approximately 5 minutes until golden and crispy. Watch them, as they can burn quickly. Allow to cool and store in air tight container until ready to mix into salad. 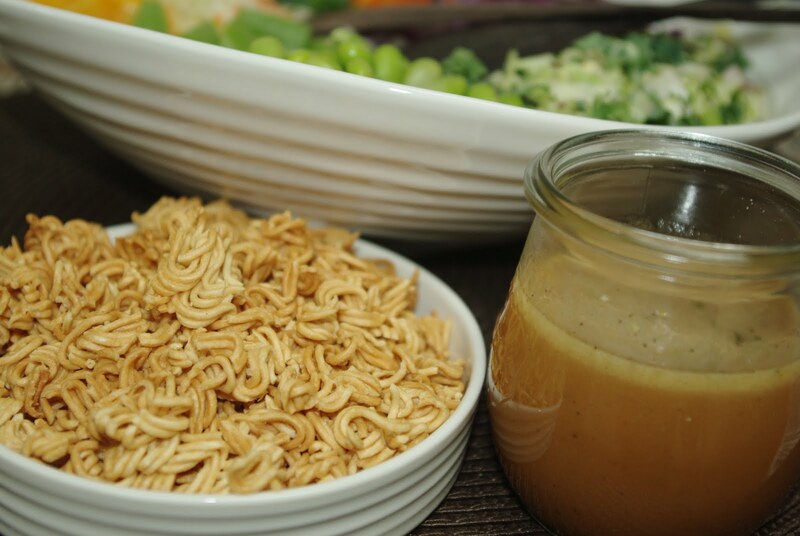 When ready to serve, pour dressing over salad, toss. Add Crispy Noodles and toss again. Such a delicious and healthy looking salad. I am getting bolder in the salads I make. There are many ideas on pin-est to give me a start. I enjoyed reading your post about using your wedding gifts still. Me too! Those corning ware look very familiar! I wish my mom had not gotten rid of her old kitchen aide--I've never had one and I bet hers would still work and be a collector's item! I do this! But for ONE person, I buy it already chopped up in a bag, and add a few things lurking in my cupboard or vegs bin. Voila! And the dressings make it: Asian, Poppyseed, mustard vinaigrette, yogurt, mayonnaise. Nuts. Although I have to admit not tried Edamame yet. I would have to buy a huge bag. And would there be budget left over for chocolate? All even more delicious if you use a bowl as the serving dish. Amazing, somehow. Yum and yum. So colourful and appetizing Kathy!